So since I didn’t have a story for you this week, I thought it might be fun to post some sketches I’ve been doodling of the Axle Setting. I’m not a fantastic artist, which is why I got a friend to do some art for my recently, but I did post up that map with Sand last week, so why not. This is Nakan, a city deep Inside the Axle, populated by the Dunloc. It sits at the heart of an empire that once stretched from the Shard Field deep into the Lower Axle. Though less vast today, Nakan’s empire is still powerful, and the city remains one of the most important throughout the Axle. Nakan sustains its people through algae farms and artificial soil farms created through alchemy. Because food is so valuable inside the Axle, farmers actually hold very high social status. Though the Dunloc have amazing ‘night’ vision, there is still the need to light their city, in particular their farms. 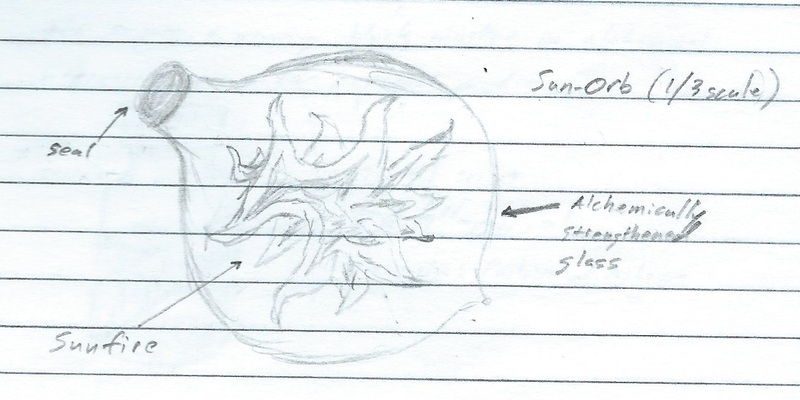 The Sun-orb, a small containment vessel for captured sunfire, was invented in Nakan. When considering what kind of currency the Dunloc would use, my first thought was your standard fantasy gold coins, but then I balked at this idea. Gold coins are a historical fact, but I wanted something different for the Dunloc at least (give the historical whatsits to the Sundermen). So I came up with these simple crystals that Nakan uses for its currency. The material is relatively common in the Axle, but Nakan distinguishes the genuine article from counterfeits via the precise cuts make on the face and side. The marks are made with a very particular alchemical solvent (the recipe for which is not public knowledge), and as a result, they react in very specific ways that can be tested. In my original notes on the Dunloc, I inserted the name of a famous alchemist who had invented the sun-orb and who had a university named after him, Acalum Kayga. I imagine this school to be the MIT of the Axle. It’s the school every alchemist wants to get into, and when someone says they studied there, people nod and start paying closer attention. While I did originally picture Nakan as a fairly isolationist city of Dunloc, that didn’t really jive well with my plans to have them be the heart of a vast empire (even if that empire was in decline). So when I started wondering what the other peoples of the Axle might be up to in Nakan, I imagined those big stalactites hanging down from the ceiling of the great cave. “I bet the Ro’pan would have a blast up there.” So now the ‘Stags,’ as I refer to that district of the city, are home to a thriving community of subsurface Ro’pan. ‘Cause why not? 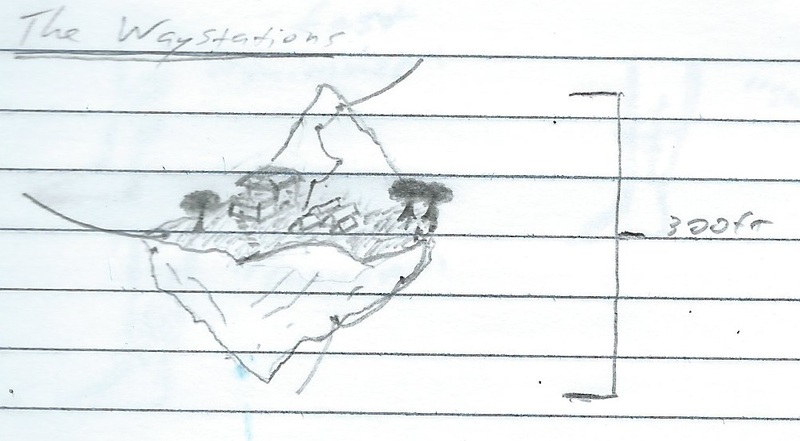 And speaking of the Ro’pan, I also have a doodle of a Shard Field waystation. A stopping point, to rest, relax, and share a story for Ro’pan traveling the Field and the rope-ways.